Dr. Douglas and Dr. Gallus talk about the benefits of facelift and other facial rejuvenation procedures. A must see for anyone considering facelift surgery. Hi, I’m Dr. Katerina Gallus from Restore SD Plastic Surgery. I’m joined by my partner today… Dr. Trent Douglas. To talk to you about facelift. Facelift surgery is a powerful and dependable way to refresh your appearance. Facelift is one part of a comprehensive approach to facial rejuvenation. A facelift may be done in conjunction with other procedures, such as a brow lift, eyelift surgery, and neck lift. Improved results might be obtained with fat grafting, injectable filler, Botox, or laser resurfacing. Planning your recovery is extremely important. Expect to have bruising for three to four weeks and swelling for about the same amount of time. Facelift is a wonderful way to turn back the clock and look younger. 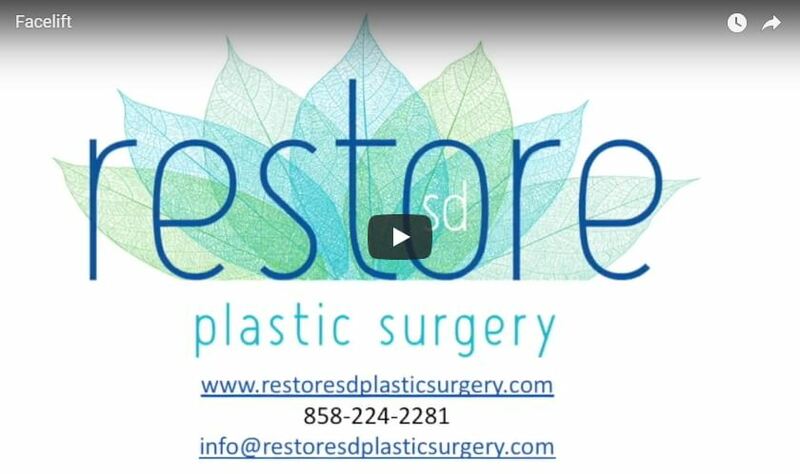 Come see us at Restore SD Plastic Surgery for your consultation.